This month’s Blu-ray recommendation is 1981’s True Confessions. The filmmakers misguide us into thinking their story is primarily about a murder investigation. The film, therefore, can become dramatically disappointing in its resolution, at least compared to other, more exciting examples of this genre. They do this by sensationalising the case’s central victim and the heinous crime perpetrated against her by suggestively basing the event on L.A.’s notorious Black Dahlia murder of 1947. In addition, the focused upon characters remain only peripherally involved in the murder itself. What it's really about are conflicting relationships and dependencies, institutional corruption that spreads to individuals, guilt, loss and sacrifice. If approached from that perspective with lowered expectations on the suspense and whodunnit elements, one can find this drama to be a thoughtful, emotionally engaging experience. True Confessions is starkly realistic not only in its period look but in delineating the details of the two brothers’ distinctive personalities and livelihoods. 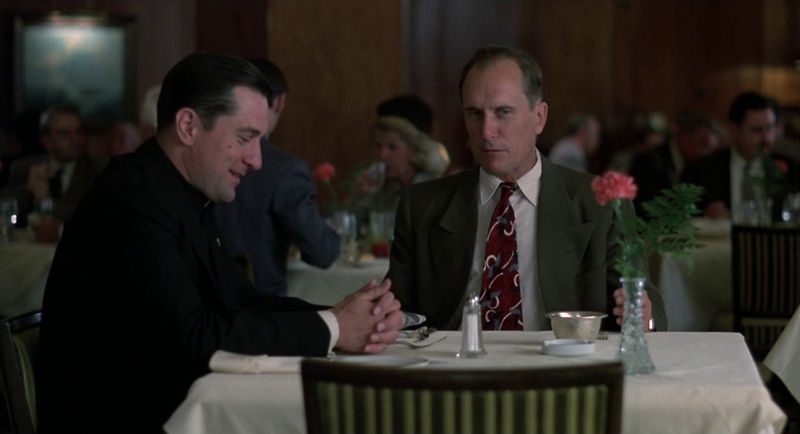 Robert De Niro plays an ambitious priest, Robert Duvall, his brother, a caustic police investigator in charge of finding the killer. The film boasts a stellar supporting cast, with startlingly natural performances secured from everyone by director Ulu Grosbard. The fastidious screenwriting from John Gregory Dunne and Joan Didion includes some choice dialogue of the most cynical kind, so cynical in fact it’s often humorous. Production elements are all top-shelf including Owen Roizman’s brilliant photography and Georges Delerue’s haunting score. As the story unravels, the unique and vibrant characters become increasingly intertwined in each others' lives, forming the insightful truer mystery at its core. The Blu-ray is available from Kino-Lorber and can be ordered from Amazon by clicking on the image below. The first is Nicholas Ray's intensive character study In a Lonely Place with Humphrey Bogart perfectly cast as Dixon Steele, whose unpredictable explosions of anger make him a prime suspect for the killing of a young ingénue. The plot intensifies when his attractive neighbour (a smart and spirited Gloria Grahame as Laurel Gray) provides an alibi and the two become romantically involved. Steele is a Hollywood screenwriter with an intelligent, witty and magnetic personality although his escalating outbursts of rage, prone to physical violence, wreak havoc on his professional life. They seriously threaten his new-found personal relationship as well even causing Laurel to consider Steele the possible killer. Dix is both highly volatile and vulnerable. His psyche is thoroughly examined to its roots in this vivid cross-genre mix of film noir, troubled romance, suspense and murder mystery. The question over Dix's involvement takes centre stage at the story's conclusion, magnified since we've been repeatedly shown he's capable of the crime in question. A final dramatic punch is delivered after the murderer is revealed when the cumulative effects of Steele's red hot temper take their tragically profound toll on his relationship with Laurel. This emotional tornado is scheduled to hit TCM (updated) Saturday, April 6 at 10am PST. Showtime information can be confirmed by clicking on the above two images. The time zone can be adjusted in the right-hand corner of TCM's schedule. My second recommendation, in keeping with the Halloween spirit is France's Eyes Without a Face, one of the Top Ten Horror films of all time. This genre's prerequisite uneasiness is present and accounted for, satisfying the most adamant gore seeker, while providing recognisable incentives for its characters' extreme behaviour. This lifts it far above the enormous dross of "slasher flicks." Following the devastating results of an automobile accident, a doctor promises his temperamentally fragile daughter hiding behind a mask: “You will have a real face.” When we realise the enormity of what he means, the 'real' horror begins. Directed with style and confidence by Georges Franju, Eyes Without a Face can be seen in all of its horrific glory on TCM (updated) Sunday, October 21 at 11:30pm PST. TCM's present month's schedule can be confirmed by clicking on either of the above two images. The Soundtrack recommendation for the month of October is Conan the Barbarian, a definitive 3 CD set issued by Intrada Records. This sensational score was created by composer Basil Poledouris at his full-throttle creative best. It can be ordered from Intrada by clicking on the image where one will also find an in-depth description of this must-have musical treasure. In October of 2012, I had the good fortune to attend a special screening of The Lord of the Rings The Fellowship of the Ring with a live orchestral and choral performance that was truly astounding and can be read about here: Treasured Appearances #2. At the end of the review, I wrote about a dream I had for other cinematic achievements with outstanding orchestral scores being shown in a similar fashion. Now it looks like that dream is about to become a reality. Amazingly, it's one of the few films I mentioned, Vertigo. The San Francisco Symphony is scheduled to perform Bernard Herrmann's score to the film's presentation on Saturday, November 1, 2014. Unfortunately for yours truly, I cannot attend. Additionally, it is sold out, however, there may be some tickets left available by phone. This will hopefully be a very successful endeavour and prompt at least a few other orchestras around the world to follow suit. The concert can be read about, and a contact phone number for further information can be found, by clicking on the image.